Spatial Light Interference Microscopy (SLIM) provides 4D quantitative, real-time and non-destructive imaging of live cell cultures, microorganisms (mycoplasma), and reconstituted protein solutions. The SLIM module works in conjunction with an existing optical microscope, and is available in three different versions: SLIM Basic, SLIM Pro and SLIM Ultimate. SLIM Basic works with manual microscope stands and is suitable for single-location, single-focus time-lapse imaging. 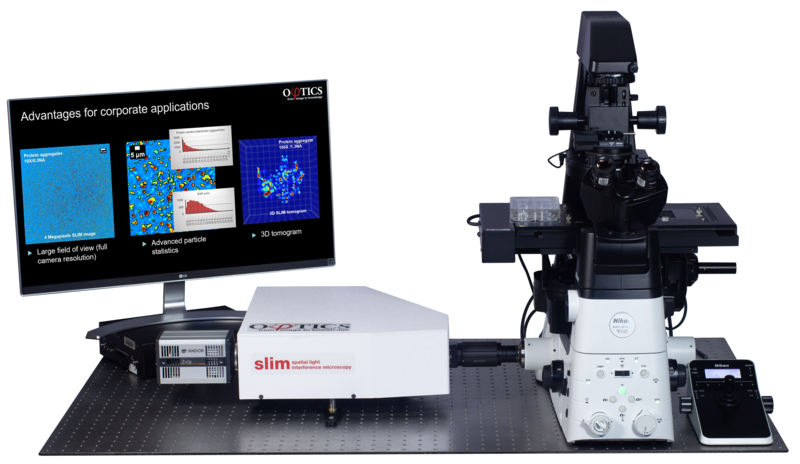 SLIM Pro interfaces with motorized microscope stands to yield fully automated high-throughput, multichannel acquisition. It is suitable for more complicated projects that require 2D and 3D scanning, multi-channel experiments and fast dynamics measurement. At full speed, SLIM Pro generates more than 1TB of data per hour. For efficient management of this high volume of data, SLIM Ultimate combines SLIM Pro with a vast storage server of 100TB. This is a customized solution. Please inquire for more details and a quote. GLIM provides quantitative, high resolution 3D tomography of optically thick specimens such as cell aggregates, bacterial colonies, 3D organoids, brain slices, embryos, and model multicellular organisms. The GLIM imaging system comes in two different versions: GLIM Basic and GLIM Pro. GLIM Basic comes with compact geometry. It connects via C-mount to microscope stands via an available camera port. GLIM Basic can function with either motorized or manual microscopes. On a manual microscope, GLIM Basic is suitable for single-location, single-focus time-lapse imaging, which can be a less expensive entry point for QPI imaging. 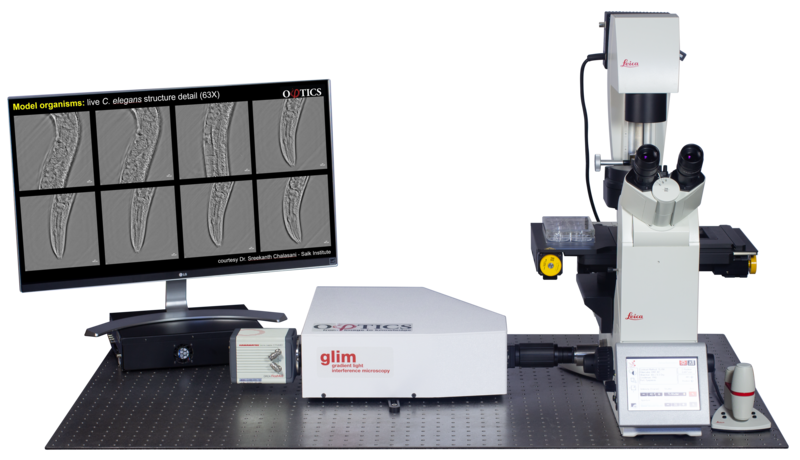 For more capabilities, GLIM Pro interfaces with motorized microscope stands to yield fully automated high-throughput, multichannel acquisition. It is suitable for more complicated projects that require 2D and 3D scanning, multi-channel experiments and fast dynamics measurement. At full speed, GLIM Pro generates more than 1TB of data per hour. Phi Optics offers customized storage server solutions for efficient management of high volume data requirements for long-term live QPI experiments. Please inquire directly for more information and a quote.